It's that time of the year that we celebrate all things Irish. At the Weber Grill Restaurant we wanted to celebrate the holiday with our own take on a traditional favorite, the corned beef and cabbage platter. To make our version, we combined the classic corned beef flavors with the smoky deliciousness of a hickory-smoked brisket. Use a good quality corned beef for this, and allow for enough time to soak in water before smoking, or it will be too salty. 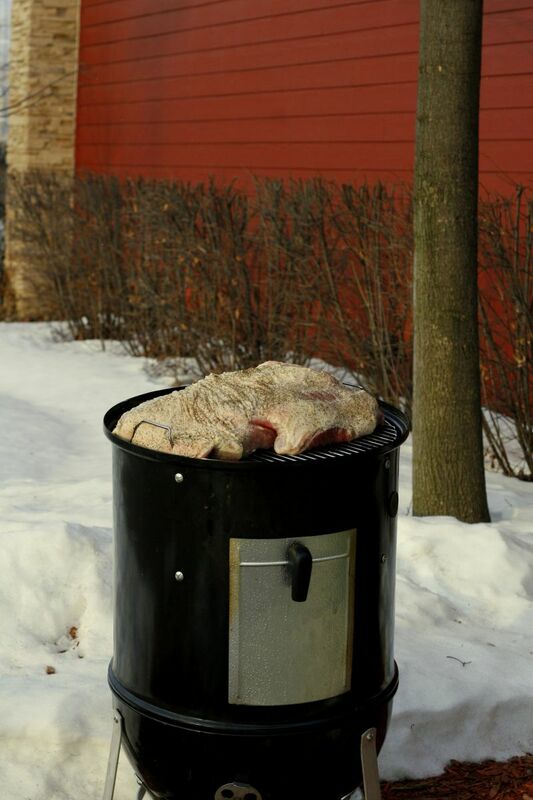 Be sure to plan ahead, give the brisket sufficient time to smoke in the smoker. 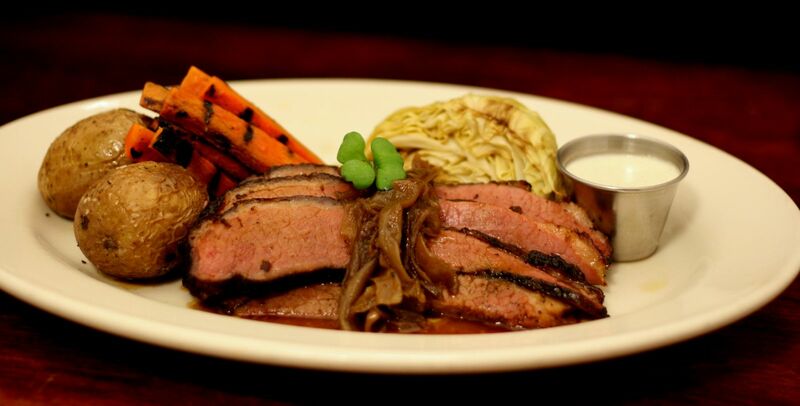 In the restaurant, we serve the corned beef with roasted potatoes, grilled carrots, cabbage and horseradish sauce. Follow our recipe below to create your own holiday tradition to share with your family. 1. Remove the corned beef from the package and discard the spice packet. Place the brisket into a large food safe container and fill with fresh water, enough to fully cover the meat. Make sure the container is large enough to hold the brisket with enough room to float. Cover the container and store in the refrigerator for 24 hours. Once the brisket has soaked for 24 hours, remove it from the water and pat it dry with paper towels. This step is really important, as it helps remove the extra salt from the brisket. 2. Trim the fat on the brisket to ¼” all over, and cut out any large sections of fat, if necessary. 3. Once the brisket is trimmed, rub it with the sugar and black pepper. Rub as much as you can on all sides, as evenly as possible. 4. Prepare the smoker for 250F and stud the charcoal by inserting hickory chunks in a random fashion. 5. 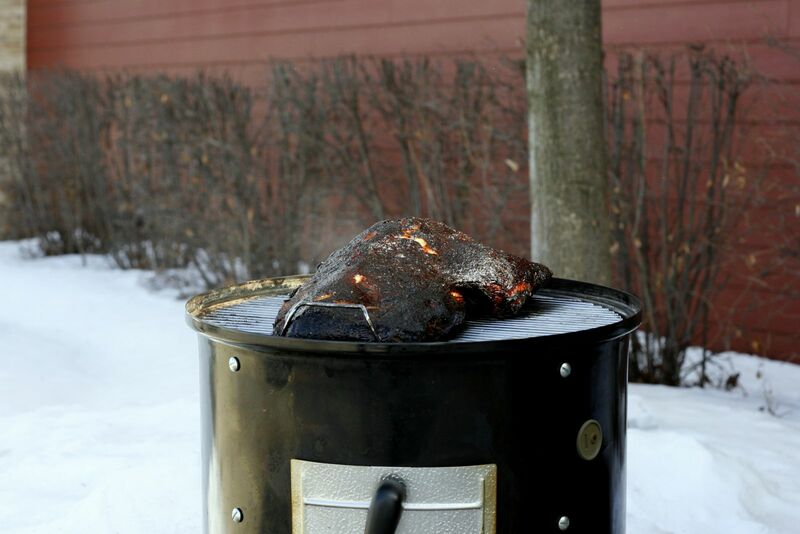 When the smoker is up to temperature, position the seasoned brisket in the center of the top rack. Smoke at 250F for 8-9 hours. 6. Check the brisket after 2 hours and load more hickory chunks, if necessary. Repeat every 2 hours, as needed. 7. To check if the brisket is cooked through, check the temperature in at least three places on the “flat” side (the bottom and larger part of the brisket). You are looking for an internal temperature of 185F. The brisket should also be somewhat soft when pushing the thermometer into it. 8. When the brisket has been cooked to temperature, remove it from the smoker and wrap with foil, 2 times, all around. Place the wrapped brisket in your oven (turned off!) to rest for about 30 minutes. 9. While the brisket rests, prepare your grill (gas or charcoal) for direct, medium heat of about 400F. 10. Toss the carrots and potatoes with olive oil and season with salt and pepper. Use a vegetable grill basket to roast them over direct, medium heat for about 35-40 minutes. They will be tender, but still have a bite to them. 12. Make the sauce by combining the prepared horseradish, sour cream and chives together. Season with a little salt and pepper to taste. 1. Unwrap the rested brisket and place it on the cutting board. Make sure you have a towel ready to catch the juices that will run when you slice it. If rested properly, there shouldn’t be much run-off. 2. Position the thickest part of the brisket to your left (if you are right handed) and make a vertical cut to separate the point from the flat. The knife should slice easily if you are cutting through the fat, if there is resistance, stop cutting and reposition the knife – you are cutting into the meat. 3. Once you separate the top from the bottom (the “point” from the “flat”), set the smaller part aside. 4. Trim the excess fat from the larger piece. See how the grain runs through the meat and cut the slices perpendicular to the grain (“against” the grain of the meat). This will give you nice, tender slices. 5. Set the slices onto a serving platter. Now, trim excess fat from the smaller piece and slice it against the grain, too. Place on the platter with the other slices. If there is any leftover juice on the cutting board, pour over the slices for a tasty, smoky gravy! 6. Arrange the carrots, cabbage and potatoes on the platter and serve. At the restaurant, we serve the sliced corned beef with some caramelized smoked onions for extra flavor. If you are not serving right away, cover the platter loosely with foil or plastic wrap to keep the meat from drying out.